I am a Certified Childbirth Educator and Rehabilitation Practitioner. I am currently completing my requirements for Midwifery registration in Alberta, Canada through the Midwives College of Utah’s BScM program. 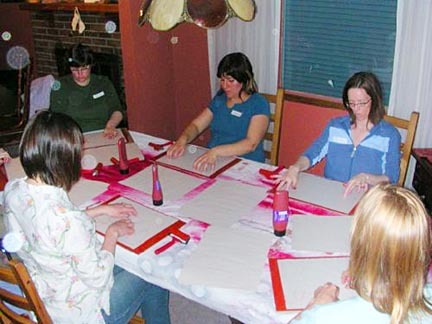 I have been facilitating childbirth classes for 3 years, and incorporate Touch Drawing within the class to help pregnant women deal with any fears, anxieties or apprehensions surrounding the upcoming labor and birth. This is where Touch Drawing is so amazing, healing, and helpful. Imagine bringing those fears down into your hands and letting them go onto the paper. We take a moment to breath deeply and relax while I put on meditative music. I encourage the women to just trust what needs to come out. They spend a lot of time rolling the paint out on the board. It becomes meditative and calming in itself. When they are ready, they lay their paper down on the paint and move their hands over the paper, getting lost in the process. When Katherine started the exercise, she had no idea if she had any fears. She said that she had not given it any thought until now. Her drawings evolved into a towering tree with a cradle hanging from a branch with her baby in it. She just felt vulnerable and helpless when she saw it. As she spent more time with the picture, she saw her face in the trunk. “My baby is in the cradle in the tree. That old rhyme about ‘when the bough breaks’ summed up all my fears about pregnancy and childbirth, and then I saw myself as the tree- and the tree is so strong and protective.” The swirling leaves reminded her that there is a force outside of her that is taking care of her baby and herself. She felt a tremendous amount of relief. Stacey was pregnant for the second time, hoping for a homebirth after her first pregnancy ended in a cesarean section. 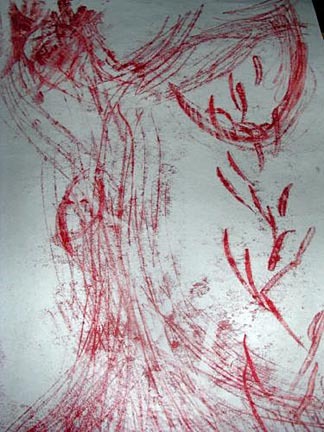 In almost all of her drawings, she had drawn the road to the hospital that she did not want to take this time. She found it so helpful to dump the feelings out of her psyche. 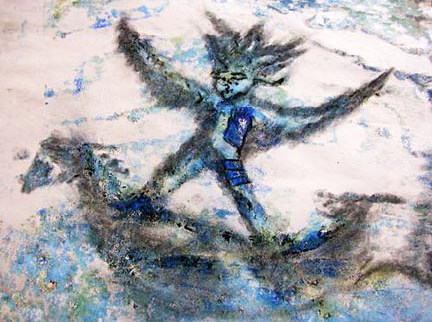 She found a giant butterfly in one of the drawings, hovering over the road to the hospital. It represented transformation, beauty and a change for her. She said that she was ready to let go and celebrate her plans to birth at home and finally enjoy this pregnancy. It is interesting that despite the topic of fear, this is the most popular ‘birth art’ project that we do. Many women, once labor starts, have taken their strongest image and taped it up on the wall of the birth room. It has also been very helpful for bringing couples together and opening communication between them. They discover issues that had not come up between them yet. Here is a beautiful Touch Drawing from one of our moms-to-be. She calls it Riding the Waves of Labor.